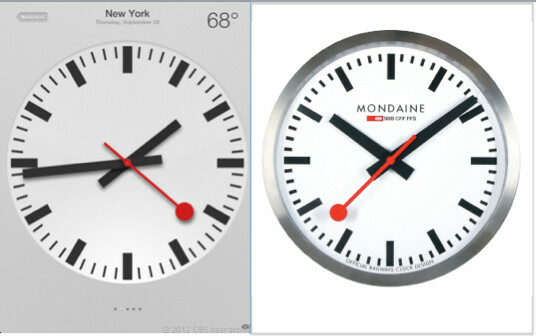 Did Apple pay $21 million to use the Swiss Railway Clock design? When the Swiss Federal Railway (SBB) got a look at the clock design on the world time application in iOS 6, it looked quite familiar. 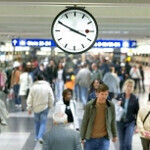 To borrow a phrase from Apple, the clock had the "look and feel" of the SBB's train station clocks. The clock was designed by SBB employee Hans Hilfiker in 1944 and has been recognized as an "iconic example of 20th century design" by the Museum of Modern Art in New York and the London Design Museum. When iOS 6 launched in September, SBB says it did not demand any payment from Apple and in fact, was honored that the Cupertino based company would decide to copy its clock design. SBB spokeswoman Patricia Claivaz said back in September that, "We're rather proud that a brand as important as Apple is using our design." Despite being so honored, Claivaz said in September that SBB would meet with Apple to discuss why the tech giant had used the clock design without authorization. In the middle of last month, both sides agreed on a deal that would allow Apple to license the design of SBB's train station clock for its mobile OS. While the amount of money Apple paid to the railway was not disclosed at the time, on Friday global news agency AFB cited a Swiss newspaper in saying that Apple paid $21 million for the right to use the design. Was it worth it? It certainly is a nice looking design and Apple definitely has the cash to pay it. But it still begs the question that SBB even wondered about. Did Apple think it was going to get away with using the design without paying for it? Well that's normal, Apple now is a huge gold mine and every1 invoved will try to ... well... mine it. From now all we will see often that Apple makes huge ridiculous payments, but not so ridiculous for some people in Apple ruling class. I have to agree with this one...$21 million for a clock design? Sounds like another Forstall deal. Apple has way too much money so why do they think they need to sue anyone? Apple is scared of Android manufacturers and Google, so they are doing whatever they can (suing) to stop the development of the Android platform. On another note, its bad for customers.. Competition is good for technology.. It keeps it advancing. Apple has deep pockets. Therefore it's not a question of worth to pay or not. Probably, for them, it's a must have that design, 'look and feel'. A clock design is worth $21 Million, but technology that your device would not work without is only worth a tenth of a penny per device? Kinda makes sense. Apple always has been about style over substance. Darn you, you beat me to the punch line. Best comment I've read so far this month. First time i read that article on PhoneArena is when the swiss company decided to enter in a friendly deal with Apple. Apple almost got away with another stealing. Thanks to the SBB, for catching them when no one was looking. I wonder about other loots which is still in the sack. Apple isn't the saint all know it. They asking to close polish FOOD website because of it's name a.pl. This company have the only one connection with Apple - they are selling real apples for food. The end *.pl is national ending of web addresses so do Apple can say what to do or not in national scale? What an "I"nnovative company ... couldn't come up with it's own design for clock ?